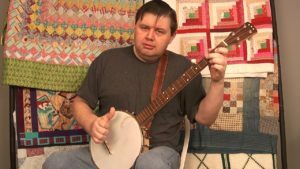 Finding melodies, good banjo playing and bad fiddling. I made the first two Daily Frail episodes of next week available early. I broke a tooth, so I need to get to the dentist on Monday. I can’t drive because I am having trouble with epilepsy. Dear Old Dad is taking the wheel. When I came back home 2014, I weight almost 300 pounds. Over the last four years, I have lost over 70 pounds. When you are going through a process this this it is hard to see any change in the mirror. Looking back on my video workshops gives a clearer picture of how far I have come. My clothes hang on me now like a scarecrow. My jeans flap around my legs like sails in the wind. Even with my belt on the very last notch my pants still fall off me. Tomorrow Dear Old Dad is taking advantage of the trip to the dentist’s office and dragging me somewhere to buy some clothes that fit. I tend to get anxious in stores and just grab some black T-shirts and cheap jeans. I figure having my clothes the same saves me the bother of deciding what to wear. When I say this to Dear Old Dad he rolls his eyes and groans. Maybe tomorrow I’ll break the black T-shirt and cheap jeans trend – but Dear Old Dad is just as bad about clothes as I am. The pair of us would be perfect for one of those makeover shows. Looking at these clothes that no longer fit and looking at how far I have come in the last four years I am aware of how lucky I am to have a friend like Dear Old Dad – and how blessed I am to be welcomed through my camera, over the Internet and into your homes. I still have a long way to go. I struggle with my health and other day-to-day challenges. I am thankful to have my meditation and photography to help me through those issues. I love what I do. Helping people make music is the best job I could ever imagine. I can’t wait to see where the music takes us next! The Patrick and Dear Old Dad Vidcast was put on hold for this week because I have been having a hard time with migraine headaches. Next week Dear Old Dad will be away celebrating his 50th wedding anniversary. The Vidcast will return in May! The bloody agonizing chord of death! Otherwise known as the F major chord. Memorization versus improvisation, among other things. If you plan on attending Patrick’s session on banjo with harmonica be sure to have a rack and a G harp with you. I will have some available for those who wish to purchase there. Also, this year we have a chaplain. 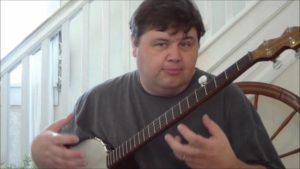 Rick MacArthur, a banjo picking retired pastor from Colorado has agreed to serve. He will conduct a non-denominational service on Sunday morning before breakfast at the fire ring just outside the center. All are welcome. Joe and Rosa Hopkins will host a gospel sing/play along immediately after breakfast in the dining hall. Somebody say Amen! Call me at 410-968-3873 for details. 3/4 time, guitars and Amazing Grace. Frailing nail blues. Jam with Patrick singing the Carter Family classic, Gold Watch and Chain. The Cat Ate My Laptop!